In this tutorial, you'll learn how to properly define the order of your campaigns from your Email Campaigns Manager. Cart Abandonment Meant to target cart abandonment sessions. It will be sent to customers who have added items to cart, went to a checkout page, but did not purchase. Browse Abandonment Meant to target window shoppers - browse sessions. It will be sent to customers to have browsed the store catalogue, but did not go to a checkout page. Post Purchase Meant to target purchasers. It will be sent to customers who have purchased from the store. Last Purchase Meant to target dormant customers. It will be sent to customers defined by a latency trigger. ie: "Last Purchase was 40 days ago"
Many refer to last purchase campaigns as "win back" campaigns. New Subscriber Meant to target leads from a list. It will be sent to new subscribers added to a list from other sources. This campaign uses our Zapier integration. The triggering of a campaign is different for each type of campaign. However, it is important to note that all campaigns need a lead to sent emails to. We define a lead as the customer of a store who has been identified by an email address. When a lead is ready to start receiving a campaign, Rejoiner will go through all of your account's campaigns and we'll check if we can start any of them for that lead. Before sending, the application will run a cross-check to verify that a lead meets a campaign trigger and meets a segmentation target. This means that – for example – cart abandonment campaigns will only be sent to cart abandoners. Once the cross-check has been passed and a lead meets a campaign filter, Rejoiner will start delivering a campaign (first email will be sent after the first email's interval as set in Campaign's Schedule). Due to the complexities of each campaign we have a recommended order that your campaigns must follow in order for the application to be able to prioritize a campaign. This means that we want to make sure that campaigns in your Email Campaigns Manager are first prioritized by trigger and then ordered by quality. You want your cart abandonment campaigns to be at the very top of the list in your Email Campaigns Manager. This will prioritize this campaign type as we want to make sure we tell the app to send this type of campaign to all qualified leads. You'll want to have your browse abandonment campaigns after your cart abandonment campaigns. We recommend to do this in order to match as many qualified leads as possible to your cart abandonment campaigns. This way we immediately match cart abandoners who have already established their interest in your store by adding products to their cart. 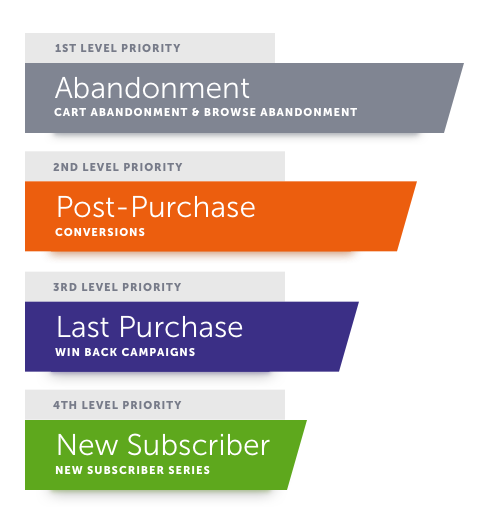 Next, you'll want your post-purchase campaigns to follow a 3rd level priority. This is very intuitive as a lead's next step is to convert. Next, you'll want your last purchase campaigns to follow a 4th level priority. This will follow post-purchase campaigns as it will become the next possible step in a lead's lifetime. Lastly, you'll want your new subscriber campaigns at the very end of the list. We do this as new subscriber campaigns are triggered by a list rather than browsing, abandonment or conversion data and thus require no prioritization. Once you have ordered your campaigns by priority, the next step is defining which campaigns are more important than orders within their campaign type. This means that we'll have to decide which (for example) cart abandonment campaign will be the 1st campaign listed and by default be looked at 1st in our cross-check. Example: Let's say you have 3 cart abandonment campaigns, each is targeting different segments. Your first campaign is targeting All Abandoners. Your second campaign is targeting Customers with a Specific Product in Cart. Your third campaign is targeting High Value Orders of $150 or more. Now what we want to do is think of what we want the application to do. Who do we want to prioritize lead matching with in cross-checking. We might want to prioritize the campaign targeting High Value Orders as our first campaign, then prioritize the campaign targeting Customers with a Specific Product in Cart as second, and have the campaign targeting All Abandoners last. This should be easy to understand and determine as you'd want to make ordering decisions based on the quality of a lead. Thus your end result would look like the example below.